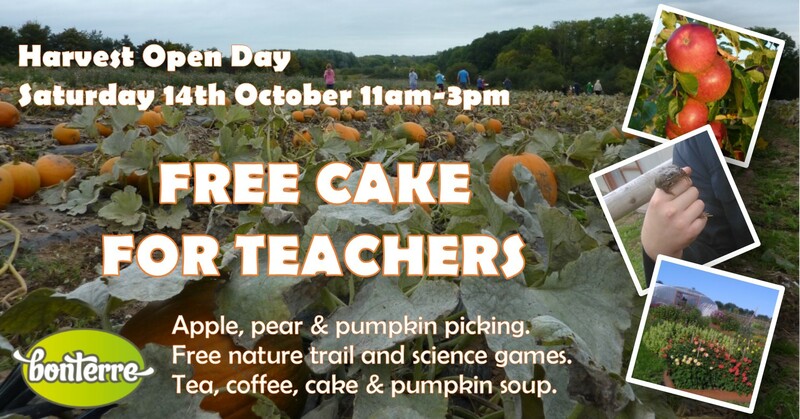 Our free, fun-packed Harvest Open Day is on Saturday 14th October from 11am until 3pm. Entry is free as are most of the activities – you just pay for any produce you want to take home. We have delicious apples and pears for you to pick as well as some of the biggest pumpkins we have ever grown ready to be taken straight from the patch. As well as our fresh produce, we will be selling toffee apples, pumpkin soup and cake. 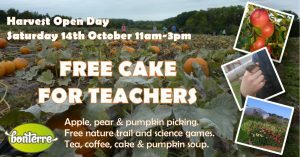 If you are a teacher, we want to reward you for your hard work in the first half term of the year with a delicious slice of free cake and a nice cup of tea or coffee. Campfire with dramatic story-telling at 11:30, 12:30, 1:30 and 2:30. Activity trail through woodland to find our secret den and complete a treasure hunting sheet. Beautiful walks around the site. and maybe some soft fruit if the weather holds. We will be selling a range of snacks in our “café for a day”. The café will also have bottles of our very own delicious apple juice. Just wait until you taste what pure apple juice is meant to be like! Education and making a difference to children’s lives is at the heart of what we do so we have a special offer for staff working in Worcestershire schools. Click to receive your free cake!